Hello, recently I re-made an old League of Legends templates and received several comments that I should make a CS:GO template so I thought I’d make a few amendments and create a new social media revamp for you guys. Hope you like it! why is it a blender file instead of photoshop? I tried to open it up, but all it does is start up blender!! 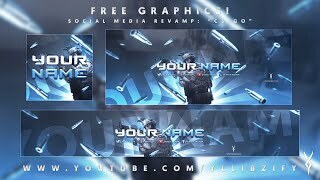 Hey dude I really like your content, I actually make quite similar work, including template packs specialising in CS:GO and what not, I have some ideas of ways we could work together that would help both of our channels, hmu if you’re interested in talking about it dude.